Arsenal had an ideal opportunity to secure a win over Tottenham on Saturday, but Pierre-Emerick Aubameyang fluffed his lines from the penalty spot. 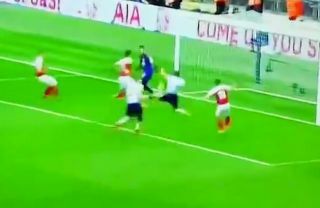 The Gunners forward produced a dire spot-kick which was well saved by Hugo Lloris, but his misery was compounded further as Jan Vertonghen produced a stunning block to deny him an easy tap-in on the follow up. With honours even, Arsenal remain four points adrift of Tottenham in third place, spurning the opportunity to cut it to just a single point. Further, the result arguably suits Man Utd too as a win over Southampton could move them back into the top four. Nevertheless, Aubameyang will be kicking himself over missing such a great opportunity to win the game, with Harry Kane’s second-half penalty cancelling out Aaron Ramsey’s opener as the spoils were shared in the north London derby. What a Horrible Penalty ?